Moscow, February 12, Interfax – An expedition is traveling from Moscow to Antarctica with the purpose of the great consecration of the southernmost Russian Orthodox church on Earth. Shortly before the start Bishop Iakov of Naryan-Mar and Mezensk performed a parting prayer for the expedition members at the Russian Geographical Society’s headquarters, the Society’s spokesperson told Interfax. The bishop consecrated the North Pole in 2011, and Northern Sea Route in September 2013. Now the hierarch is to consecrate a church on the sixth continent. The Holy Trinity Church was built of cedar and larch on King George Island beside the Bellinshausen station on February 15, 2004. 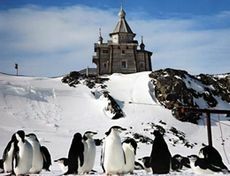 This is the only permanently active church in Antarctica. Employees not only from Russian but also other stations come here, and it is here that the 64 Russian polar experts who died while researching Antarctica are being commemorated.